I had a small fracture in my right foot (5th metatarsal). I did it in December, and was in a temporary plaster for just a few days and then was told I would be ok to wear a big boot. I had this boot on for about 6 weeks. The foot has never felt quite right since and I get soreness if I walk too far or drive too far. I also get peculiar sensations in it often - sort of tingling and a 'springy' sensation. However apart from that it has been ok and continuing to improve so that I have been getting back to normal life, even being able to go for walks of about 5 miles or so and drive a couple of hundred miles again. However for the past few days it has started to hurt more again, and a couple of days ago it went really very hot inside and I had a burning sensation all down the edge of my foot. It lasted for a few minutes that was all and then passed, but has been sore since, and now today it is really painful and I am getting a sharp stabbing pain in the area that was broken. I am worried that the break has not healed properly. Is this likely? Do you think I need to see my GP about it. it isn't bruised or swollen or anything, just very painful. In addition I am now getting some pain in the ankle and leg on the same foot too. It has now been seven months since you fractured your fifth metatarsal and you are still having pain. Assuming you had no further trauma to the area since the initial injury, on the surface at least, it would seem like there is a real possibility that your fracture has not completely healed. 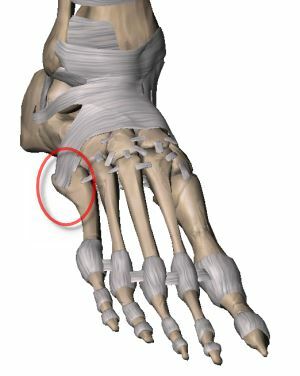 but most of these types of fractures occur at the base of the fifth metatarsal since it is the most susceptible part of the bone in simple foot trauma. As you have probably read, fifth metatarsal base fractures can be difficult to heal simply because the blood supply to the fifth metatarsal base is so poor. Because of this in many instances, patients have to stay immobilized longer than six weeks. You do not mention it, but I assume your doctor took a final x-ray prior to discharging you to confirm the fracture had healed. The fact that you experienced continued pain and a 'springy' sensation in your foot right after the boot was removed strongly suggests to me that you did not have complete healing of the fracture site. In particular, the 'springy' sensation sounds to me like you were experiencing a hypertrophic non-union. What that means is that on x-ray (last x-ray), it appeared as if 'bone bridging' had occurred which would, in most cases, signify that the break was healing nicely and since it was six weeks since the trauma, that the bone was virtually healed. In a hypertrophic non-union, it appears like there is bone bridging but in reality it is an incomplete healing process. There is fibrous tissue across the fracture site which kind of stabilizes the fracture, but this fibrous tissue never turns into actual bone and so you could continue to have pain and certainly the 'springy' feeling could movement in the fracture site. Keep in mind, I am three thousand miles away and have not had the luxury of examining you, nor have I seen any x-rays but based on your narrative, that would be my first thought. So, my suggestion would be to certainly have your foot examined by a foot specialist or orthopedist, not so much by your General Practitioner as this is no longer a problem with a simple acute fracture. If the specialist does not suspect anything else other than a non-union, but the x-ray is inconclusive, then a bone scan may be necessary as it will be more specific for the possibility of a non-union that may not show up on x-ray.